Sometimes when I'm putting together a Tuesday Trend I think to myself "Oh. This is ok. I mean, a lot of people like it so it can't be all that bad". As I search for more related items I find myself saying "Hmmm. You know, I really like this." After a while admiration turns to obsession and I find myself thinking "Can I feign illness today and perhaps spend all day finding doilies and sewing them into every thing I own? 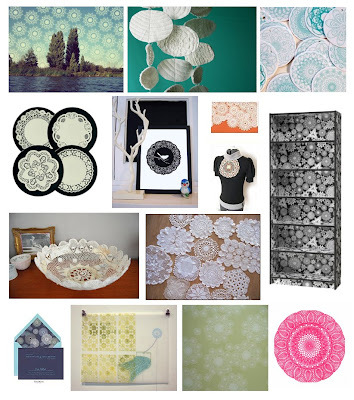 Is there a doily emporium nearby???" (Answer: No).